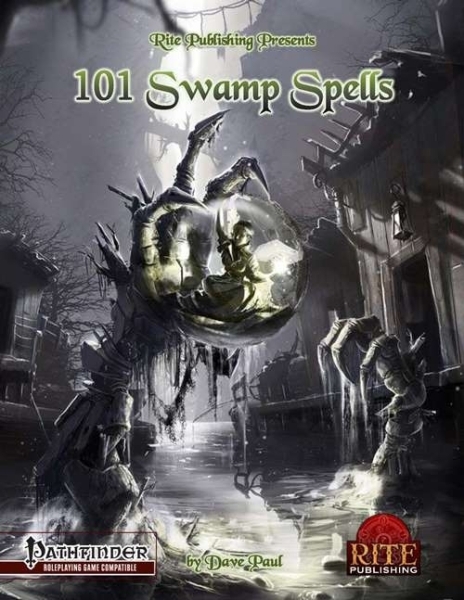 101 Swamp Spells is an epic fantasy supplement for the Pathfinder Roleplaying Game, written by David Paul and published by Rite Publishing. This installment of Rite Publishing’s 101 series takes gamers to a place that is both loved and feared; the swamps. In the real world, swamps are very deadly places. In the real world there is no guarantee that the next step you take will be on firm ground, no matter how firm it might look. In real world swamps, any of the animals that don’t want to outright consume you, tend to carry some type of disease that will kill you, only much, much slower. In the real world swamp, dry is a foreign concept; no matter how far away from the water you are, there is an overwhelming sense of moist, clammy and damp. The environment keeps changing and can flood with little or no warning. Now when you add swamps to your fantasy world, things get even worse! Now you have magic, and magical creatures and intelligent races that are as at home in this dynamic environment as humans are on regular land. Swamps are a place with a special draw for many gamers. T.V. shows like Swamp People, the dreaded fire swamp in the movie The Princess Bride and the comic and movie The Swamp Thing are great examples of people’s fascination with this environmental nightmare. Who could blame anyone for wanting their fighter or witch to spend a few gaming sessions in an asymmetric environment like this? 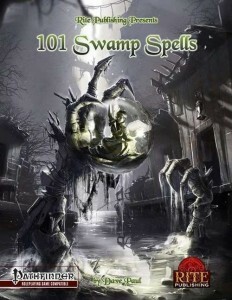 Rite Publishing has done what they normally do, they saw a need, assembled a crack team and have given us 101 Swamp Spells. Many of the spells in these 38 pages of crunch are variations on existing spells that most Game Masters and players know. Rite Publishing didn’t just take existing spells, change the names and call it a day, they built on the foundation of those spells , seasoned them up and added some toppings that scream swamp. I had no idea you could do that much with fog. I’ve seen it used in horror movies, but in Rite Publishing’s naughty little hands things escalated quickly. On my initial read through nothing jumped out as unbalanced, there were lots of devious spells in this collection, but everything seemed above board. No company is 100%, but Rite Publishing has shown themselves to be very responsible when it comes to ensuring their products are balanced when they need to be, and clever in their overall design. The biggest problem with this product is its limited use. Many of the spells described in this book could be used many places, but when you specialize something like this, limits occur. I actually looked at many of the spells, thought about using them in a sprawling urban sewer and many of them still worked. This product is a wonderful companion for a campaign based in a swamp, but for a caster who has to select spells they might be stuck with for several levels, or for the rest of their adventuring career, this book could hurt, badly. Many of the spells are usable outside of the swamps, but some of them lose usefulness quickly when say in a desert. The artwork and formatting are great; the page borders are standard fare for Rite Publishing, but I’m glad they went with swamp green instead of their normal light tan. There is no doubt this book is part of Rite Publishing’s 101 series. Rite Publishing has done a great job establishing their brand and making sure the people who see their products know who made them. If you as a Game Master are looking to get your players soggy, this book is a must. For any spell slinger, 101 more spells to choose from is never a bad thing, well unless you have a player who can never really finish their character because they are looking for just the right spell. Because I’m not a nice person, the next game I run in a swamp, I will ensure my spell casting NPCs use these to great effect on my players before I grant them access to them. This is a well-made product that fills a rather specialized role. With minor tweaking and some creativity, many of these spells can be used on dry land, but most of them are more fun when surrounded by Kermit and his cousins.